Looking to create an employee recognition formula that works? 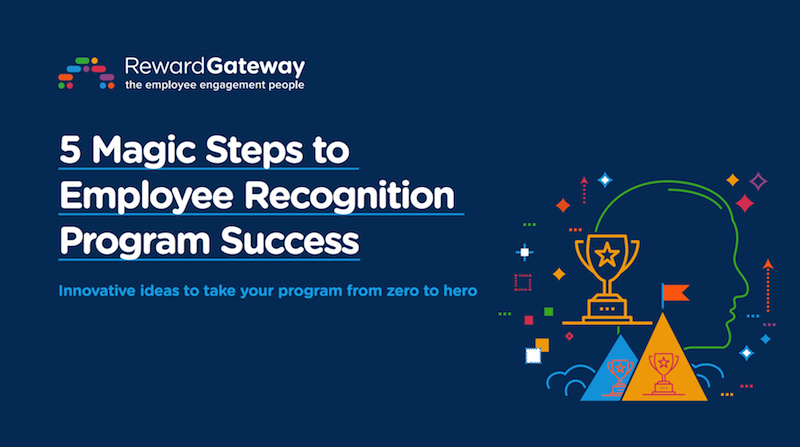 Discover 5 actionable magic steps you can take to help create your employee recognition formula and shine a light on your program to increase engagement. These days, companies of all shapes and sizes are embracing employee recognition as a tool to drive engagement, improve morale and combat demotivators in the workplace. That being said, it can be challenging to know when and how to show appreciation – especially for managers. A lack of manager-led recognition is often a top reason employee recognition is inconsistent in the workplace. This can negatively affect employee engagement, the customer experience and a company’s ability to achieve desired results. If your organisation is like many of the companies we partner with, there are a number of ways to provide recognition to your employees. But, deciding which method to choose isn’t always easy. The good news? You don’t have to choose just one! People respond to recognition differently based on individual preferences. Starting with a combination of these five recognition methods will help you create a formula for recognition, while providing a great opportunity to demonstrate gratitude and encourage consistency in employee behaviours. There are three steps to make employee recognition messages more strategic in order to show appreciation for a success that helped improve the employee or customer experience which is tied to your company’s values, purpose or objectives. Share a story that includes specifics on what the individual(s) did and how it had an impact on the organisation. This helps employees feel appreciated for the relevance of the work they do and also highlights best practices that their peers can learn from. Although spot recognition is less strategic, sending a quick thank you for consistency in expectations (such as arriving on time and prepared or greeting customers a certain way) supports behaviours important to the culture and reputation of the organisation. 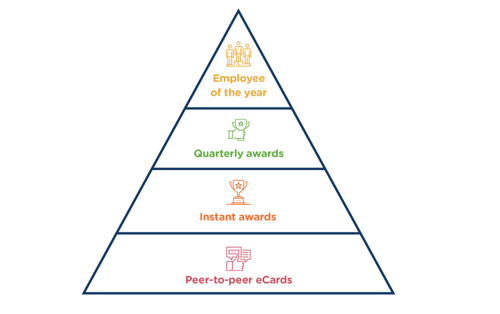 A peer-to-peer or manager-led eCard is a great way to show appreciation for employees immediately after the great behaviour. Make it even more visible by sharing it with the entire organisation on a social recognition wall. In my 20 years in the industry, I’ve never worked with an organisation that didn’t want better teamwork or collaboration. When a group of individuals work together to accomplish a goal or project, it is absolutely recognition-worthy. Calling out what the group did well shows appreciation, demonstrates the relevance of employees’ good work and reinforces the importance of collaboration. Keep in mind, there are different levels of recognition and it all depends on what you choose to focus on at your organisation. To help you create your own unique formula, use our recognition pyramid as a guide to the different levels. When employees go above and beyond to focus on their career development or seek opportunities to grow within your organisation, take the time to acknowledge that behaviour. With an employee recognition program, you can shine a spotlight and recognise employees who earn certifications, complete courses or take other steps towards career development – their focus and time investment are advantages for both their career and the organisation. At its core, your recognition program should always be human and focus on your people. But guidelines are needed or else people may not adopt or use it – which is why training your managers to recognise employees is key. Work anniversaries are a great time to celebrate your employees. Consistently acknowledging work anniversaries demonstrates appreciation for the employees’ loyalty to the company and also recognises career longevity. 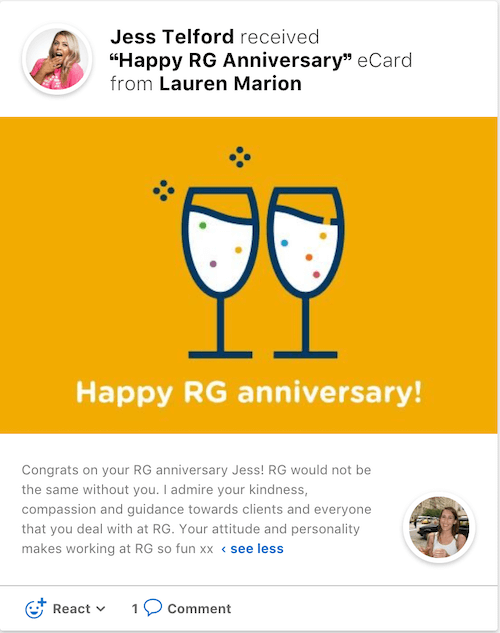 Sending a Happy Anniversary eCard highlights employee progress and celebrates loyalty. 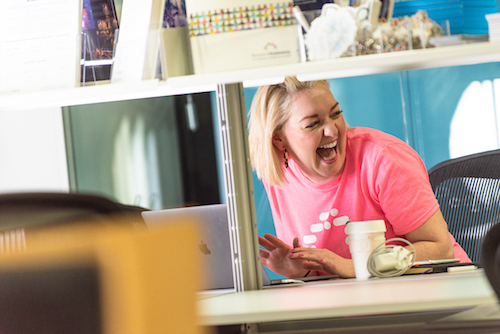 It makes the employee feel a sense of pride for the work that they do day-in and day-out – helping to create a culture of continuous recognition. Remember, not all recognition is created equally. If recognition doesn’t come naturally to your managers, consider providing them with a variety of methods as opportunities to drive engagement through showing appreciation. Recognition, when done consistently, helps employees feel respected and reinforces the relevance of their role with your company. This not only improves working relationships, but helps improve your company’s culture and achieve desired business results. 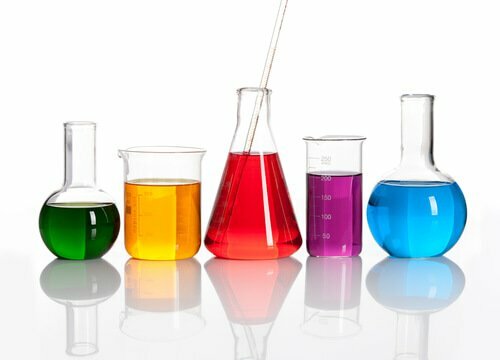 Tell me, what will your unique recognition formula be?